The ArcLight Cinema and its surroundings are not typically crowded at 9:00 a.m. on a weekday morning. But over the past three days, the area was swarming with credential-wearing, tote-carrying documentary filmmakers and smiling, helpful, eager volunteers clad in bright orange T-shirts. Nonfiction had descended on Hollywood. What were my takeaways from Getting Real? Fifty-two pages of furiously scribbled notes, two large handfuls of precious business cards, a long list of documentary films to catch up on, reconnections with old friends I had not seen in years, and many new acquaintances made. 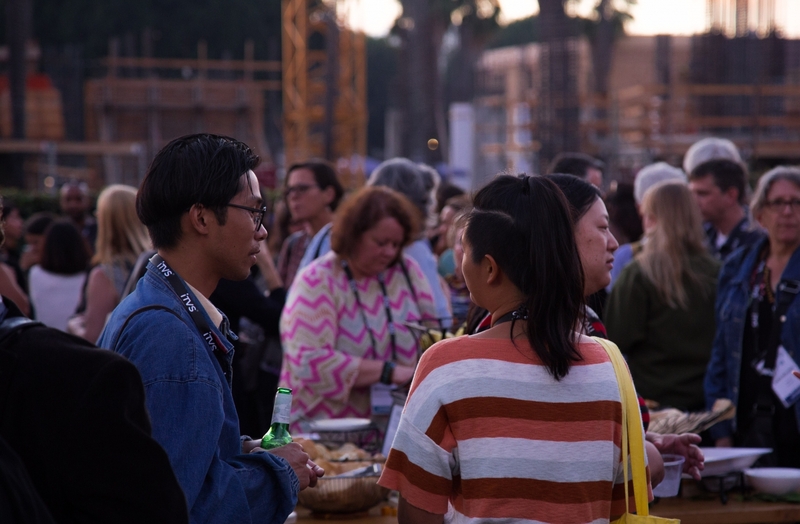 Tonight at the Closing Night party, as I shared a drink with the other thousand attendees in the back lot of Pickford Centre, bathed in the golden light of "magic hour," I got rather wistful. The past three days were a whirlwind, and then it was over just as I was finding my groove. When I first attended the inaugural Getting Real back in 2014, the feeling was more intimate. Now in its third iteration, it's become more of a juggernaut: attendance has tripled, and there were more than 90 sessions in nine separate venues. You definitely had to keep your eye on the clock as you dashed out of one seminar to attend another panel. But the friendly and casual vibe was still there. The informal lunches in the back lot, catered by gourmet food trucks under the California sunshine, certainly aided that. As I broke bread with other filmmakers, we discovered mutual friends in common and talked about current and past projects, but also about the difficulties of managing the role of parent/artist, the guilt of leaving behind young kids when you are shooting around the country, the schools system, websites, and the spectacle of the Kavanagh confirmation hearings going on in Washington. At the beginning of the conference, IDA Executive Director Simon Kilmurry encouraged us to go to a session you would not normally go to, and talk to at least three strangers a day to get out of your bubble. Emboldened by that, I struck up conversations with people in line who happened to be from Copenhagen, Istanbul, Chicago, Portland, Washington DC, Santa Fe and New York. And that was Day One. This afternoon—Day Three—I attended Equity Investment in Documentary Film, which dealt with the pros and cons of finding investors in your film. Yes, you read that right. The growth of nonfiction content on streaming platforms has resulted in new sources of finance beyond the generosity of your immediate family and grants. Large billboards of documentaries on Sunset Boulevard certainly give the impression that there is money to be recouped in the field of nonfiction. But the panelists emphasized that it was important to be candid to potential investors that documentaries are not typically a revenue-generating vehicle where you can turn a profit. The kindness of strangers only goes so far. So how do you close a deal, and is there a lingua franca that rich people speak? Apparently, the answer is not to view them as a checkbook but as long-term funder, to include them in conference calls, send them rough cuts, invite them to help with the impact campaign, and make sure they get to walk on the red carpet—a red carpet, mind you; not The Red Carpet of the Oscars. Desperation for funds can sometimes lead you to make Faustian pacts, but don't sell potential investors a producer credit—or co-producer or line producer, for that matter! As one panelist suggested, "If you want advice, ask for money. If you want money, ask for advice." For those of us who haven't yet encountered the millionaire next door, we continue to apply for grants and struggle with financing, pouring a lot of sweat equity into our films. But as I came home tonight, my tote filled with business cards and film postcards, I was tired yet enthused. I've made this my livelihood for the past 20 years, and gatherings like these make me hopeful about the future. Darianna Cardilli is a Los Angeles-based documentary filmmaker and editor. She is currently editing the documentary feature 8 Billion Angels. Her work has aired on Bravo, A&E, AMC and The History Channel.